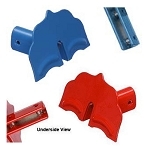 Clamp-to-seam snow guards are snow cleats for metal roofs which clamp on the standing seam of a metal roof. 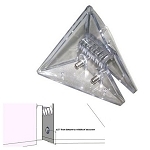 Clamp on snow guards are roofing hardware used to keep snow from sliding off a metal roof and causing damage or injury to people and property below. 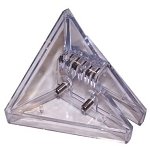 Typically two set screws are used to squeeze or clamp these types of snow guards in place. They do not penetrate the roof and no glue or sealants are required to install them. If you have a standing seam metal roof where clamp on snow guards will work, this style of snow guard is our first recommendation as they do not make any holes in the roof deck.